Photographs are imprints of memory, records of events. It allows the viewer to observe, taste, guess at, recall, even re-live experiences. "Snapshots over the Years: Passion and Images of Hong Kong" comprises 6 parts: Biography, Worklife with KMB, Vanished trades, Street lives, Home in So Uk, and A conversation of 2 generations: Ho Saus Photography. Apart from touring through the gallery, one may examine how Ho Saus life impact his creative pathway, and allows him to give personal accounts for his own works. Copyright © 2012 Hong Kong Memory Project. All rights reserved. 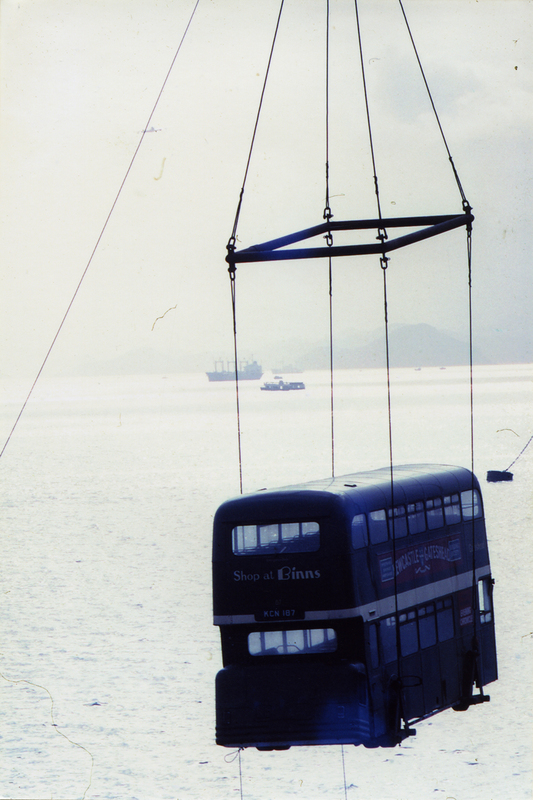 The bus case was hoisted up to be assembled in the depot. Workers cleaning the machines in the KMB depot. 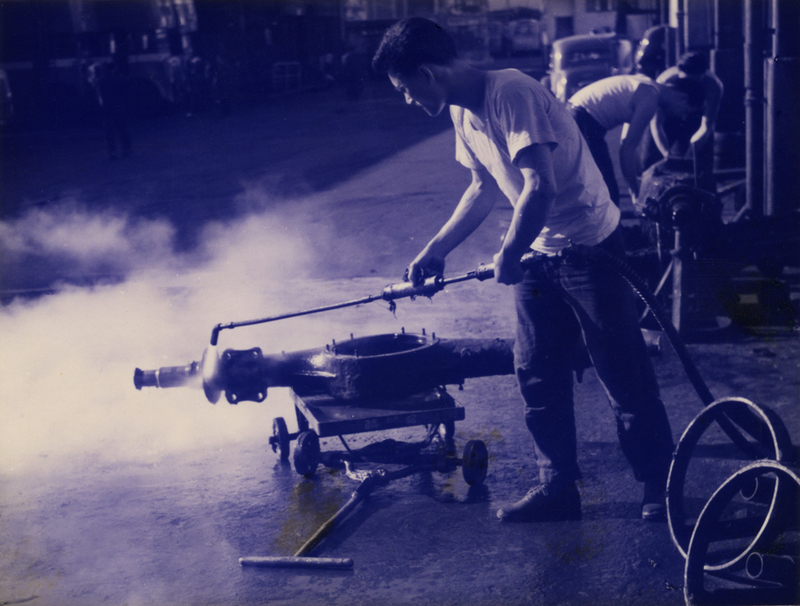 The workers used high-temperature steam to remove the grease from the parts, added new lubricant, and reassembled the machine. The sideways lighting added to the depth while the steam helped bring out the theme. Driver hurrying to finish his lunch. 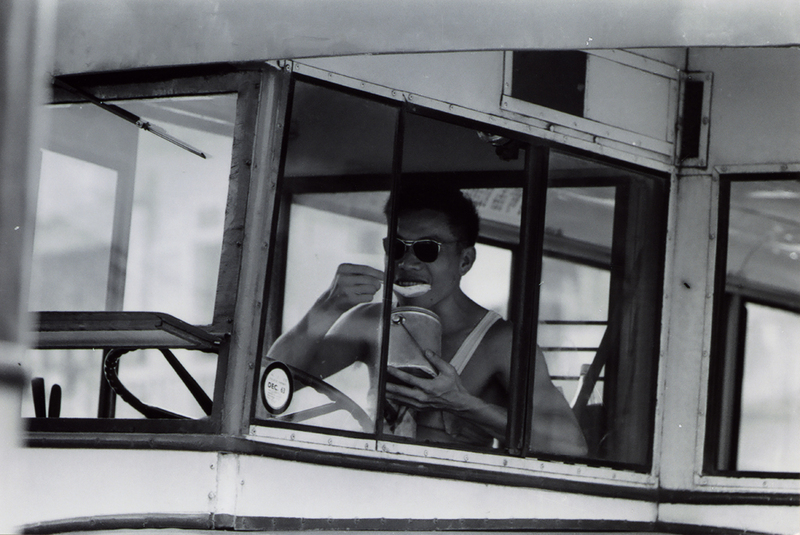 Because KMB did not provide lunch time, drivers had to make early departures or grab quick bites between stops. Many bus drivers therefore shared a common occupational illness: stomach pains. A top-down view of the So Uk Estate bus terminal. The colours that Ho Sau observed during filming were different from that of the developed photograph. Temperature changes led to changes in colour temperature creating unexpected effects. The three curves lead to an extension of space implying greater possibilities beyond. Passers-by waiting for the transport in heavy fog. 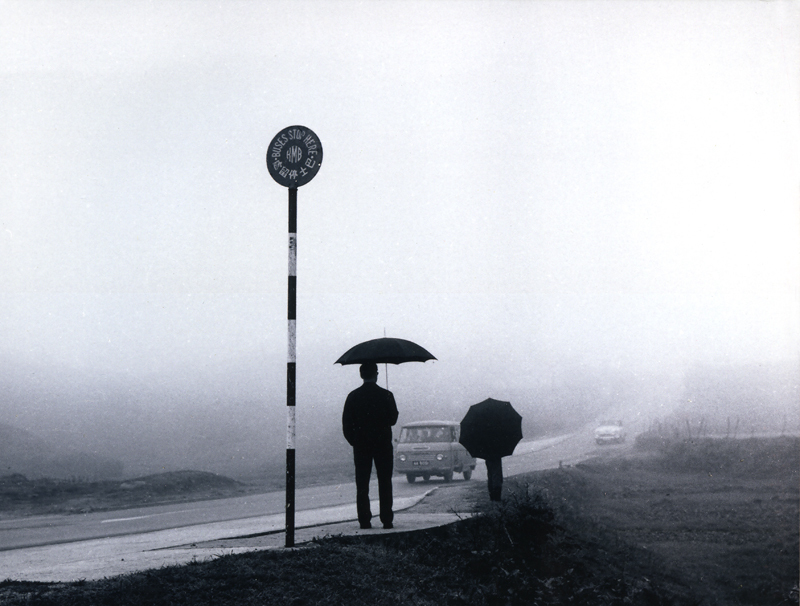 In the heavy fog with light rain, two persons holding umbrellas were waiting for the bus in the foggy countryside. Shooting in the heavy fog usually grays out the picture; only using wide lenses to shot close-up to the subject can create clear black and white. 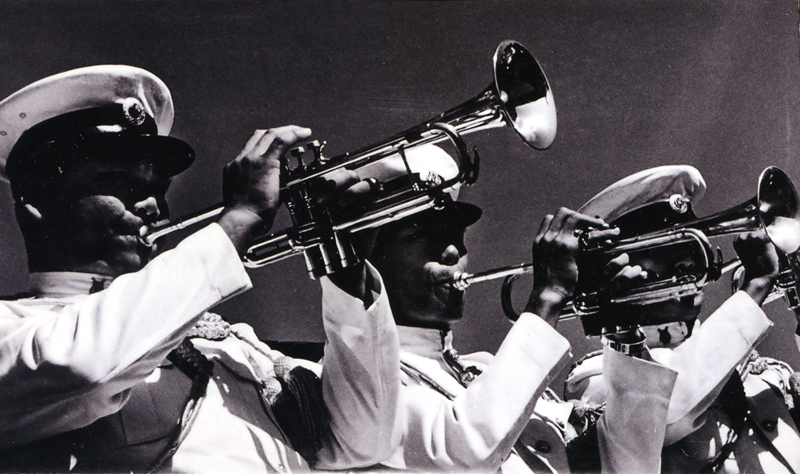 The KMB marching band was formed by ticket sellers and checkers, and gives uniformed performances. They would resume work after a performance. Three performers of the marching band were arranged diagonally in this photograph and their varying distance from the lens creates a sense of depth. Yellow filters were used to make the sky dark grey and highlight the subjects. 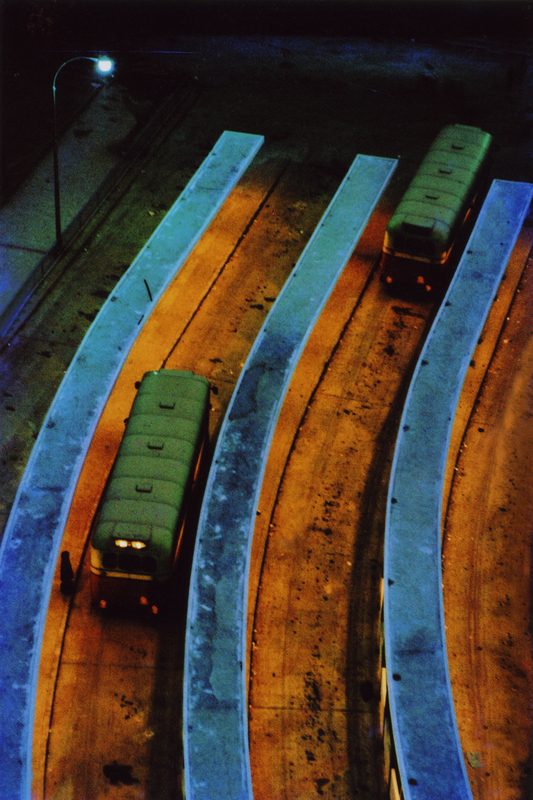 Documentary photography may occasionally be presented from another angle using subjective imagination. 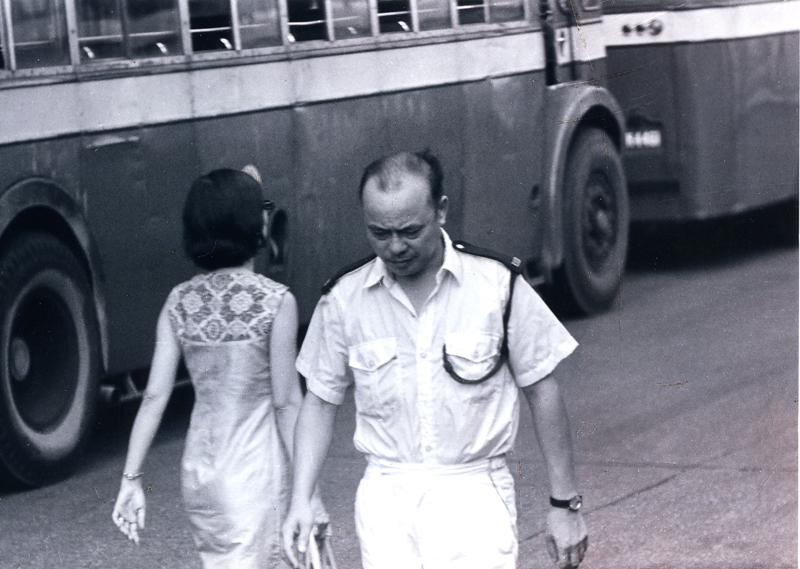 The picture used a 1970s bus as the background to specify the year and background; the man was furrowing his brows in displeasure and the woman was walking away from him. Ho Sau imagined that they were walking their separate ways, and used composition, direction cues and background to create this photo in his subjective eye. 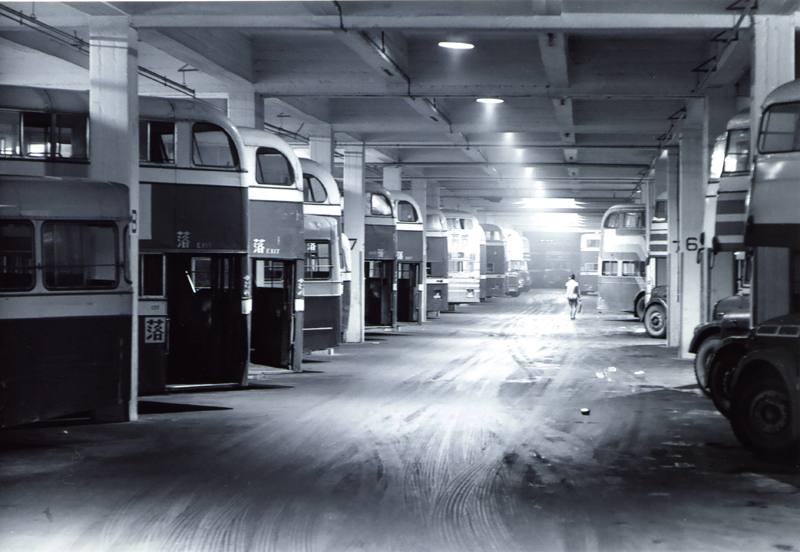 The picture shows the bus terminal outside Star House, formerly known as ‘Tin Sing Hang. 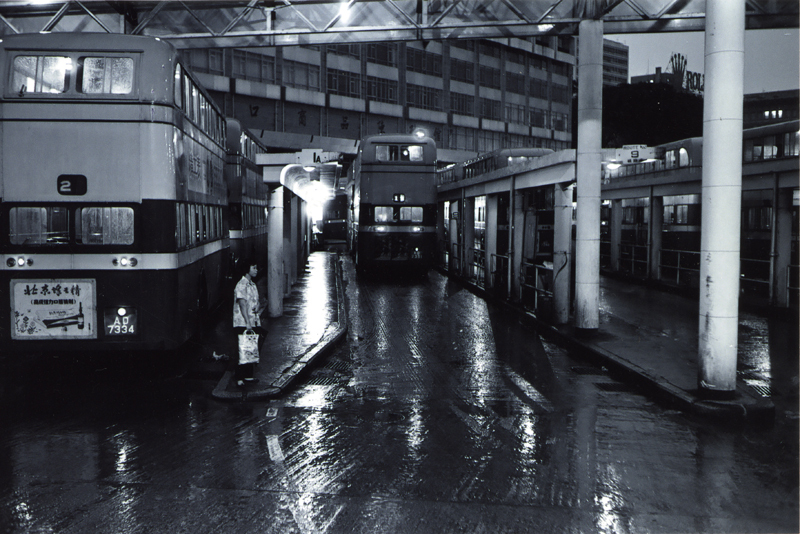 Ho Sau drove Bus No.2 into the Star Ferry Bus Terminal and caught the sight of a woman waiting for bus or somebody. 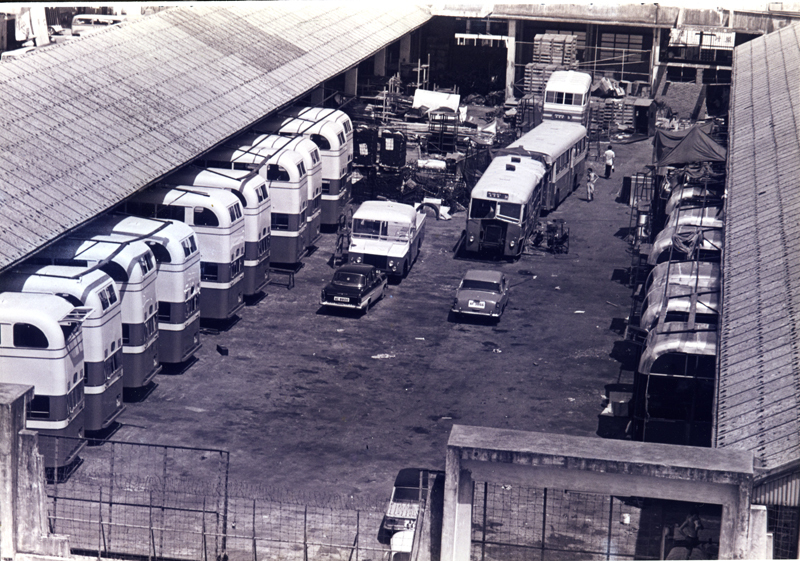 KMB depot at Po Lun Street, next to Mei Foo Sun Chuen. It is now moved to the New Territories. 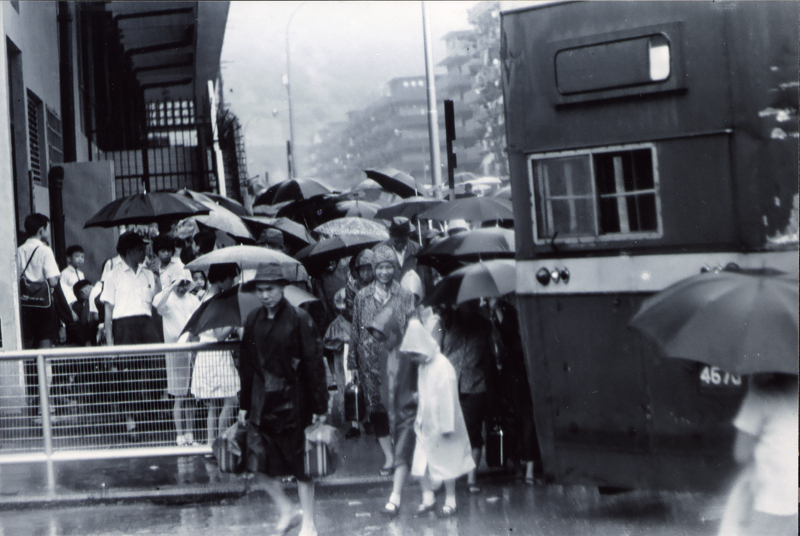 Pupils going from school back home in the rain. People and buses were jammed on the road. The Lei Cheng Uk Resettlement blocks were visible in the distance. A view of the KMB depot from the rooftop. KMB technicians changing tires. All changes and mends were done by dedicated mechanics. 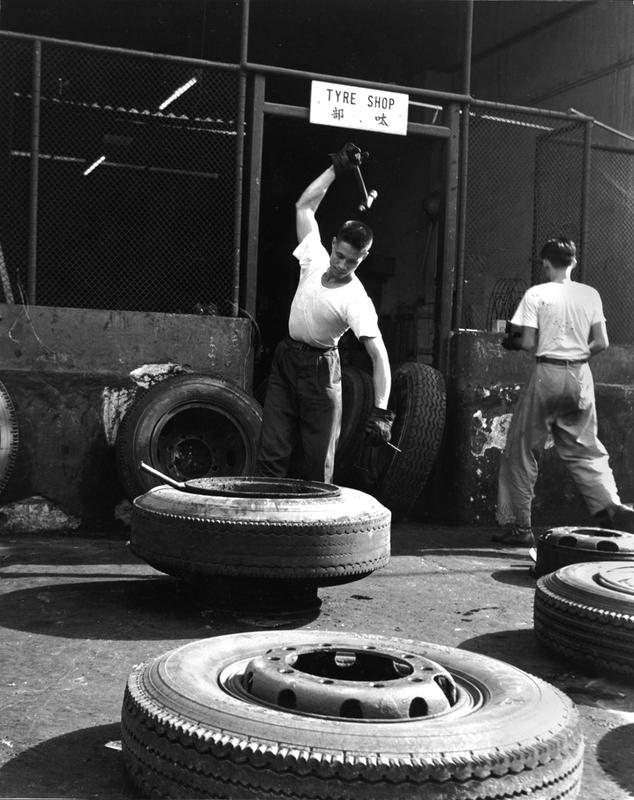 Their jackets were marked with the words “Tire department”.